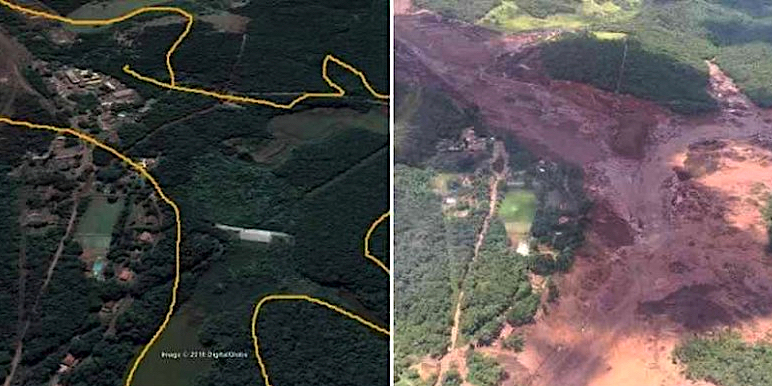 On 25 January 2019 three iron-ore tailings dams collapsed at the Córrego do Feijão Mine, part of the Paraopeba Complex. The dam under the responsibility of the mining company Vale is in the municipality of Brumadinho, at the metropolitan area of ​​Belo Horizonte, Minas Gerais. It is estimated that 14 million m³ of tailings spilled on the Paraopeba River, one of the main tributaries of the São Francisco River. Authorities say over 60 people have died and 300 people are still missing. The evidence of yet another socio-environmental crime of incalculable size strikes us again. The public authority did not listen to the communities and acted in favor of corporate power to relax licensing norms and allowing the expansion of the dam complex in December 2018. We at Movement of People Affected by Dams (MAB) understand that this is a continuing crime by Vale against the Brazilian people. Three years ago, another dam at the Samarco mine jointly owned by Vale and BHP Billiton burst: but no house was built, we do not know the number of people affected, there are no study on the impacts on health, women are not recognized as affected, among other environmental violations and rights of those affected. Up to date, the judiciary has not held any of the directors of the companies involved in the crime responsible and has not ensured the full reparation of the families. On the contrary, it has acted in punitive selectivity, criminalizing the struggles of families, popular movements and civil society organizations. Once again, these large corporations enjoying full protection from governments demonstrate their affinity towards the maximising profit at the cost of the quality of life of people. There is no regional development, there is only destruction of lives and contamination of rivers and nature.